Since they get along so well, we had high hopes for having them share a room. What could be better than sharing a room with your BFF? I could (and hopefully will) write a full post about how the transition to a shared space is going (spoiler: awesome) but for today, we're just talking decor. We swapped Piper's old room for the guest room, to give the girls as much space as possible. Soooooo, yeah. We had a little bit a of work ahead of us. 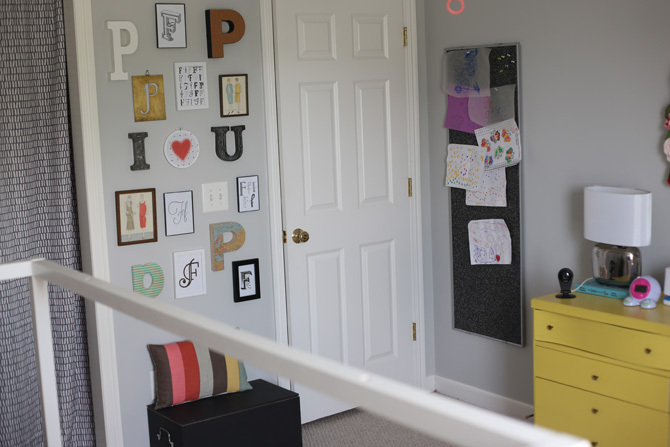 Piper was still in her old room, so it was an elaborate shell game as we shifted things from room to room to get things done, while still having a usable space for her to sleep. The first thing we bought for the space, was a twin sized loft bed for Piper. We debated getting a toddler bed, but we figured it would make more sense to spend the money on something that she could use for years to come. 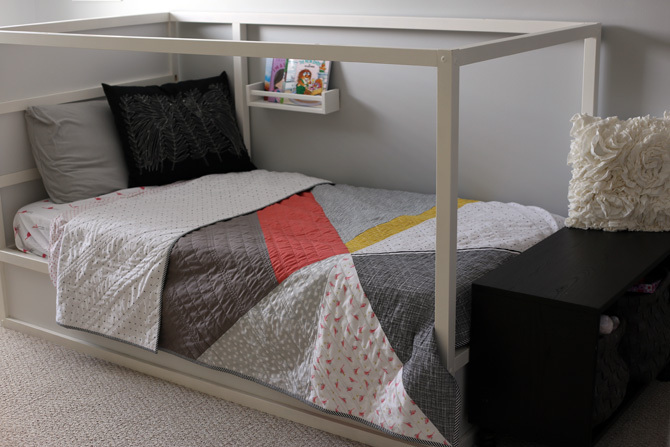 Plus, this bed frame has the option of being set up as a canopy bed, or a loft. And the best part? By adding a mattress on the floor, it can be used as a make-shift bunk bed. 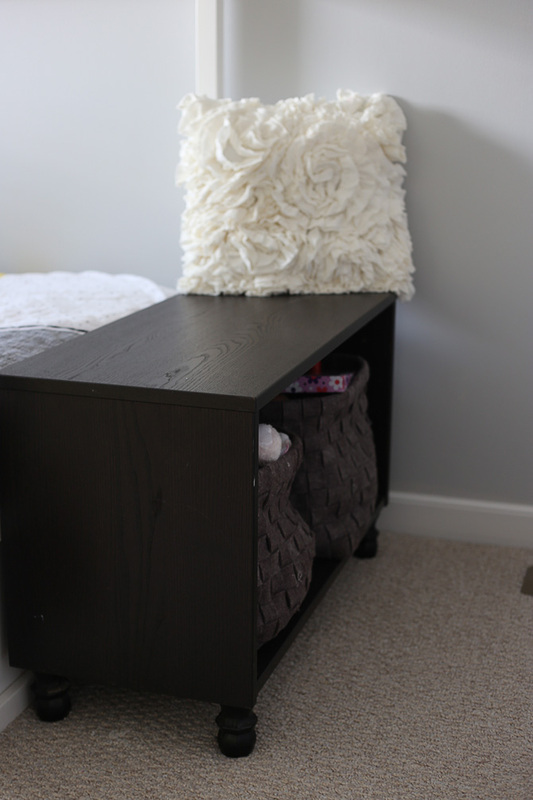 It may not be a forever solution, but it's shorter height makes it the perfect situation for our girls. A quick coat (or three) of white paint, and it was ready to go). In signature Courtney fashion, the paint color was a total fail again. Seriously...at this point it's becoming a bit of a joke. I don't know how I could be soooooo consistently bad at something. After hanging up 20 nearly identical swatches of light grey, we landed on what I thought was the winner, but after purchasing it- a full gallon, because I was inexplicably confident- it ended up looking way too blue. I took it back and had them try to match our second choice and thankfully it landed somewhere in the middle...a nice neutral. Whew. The last big project was the closet. 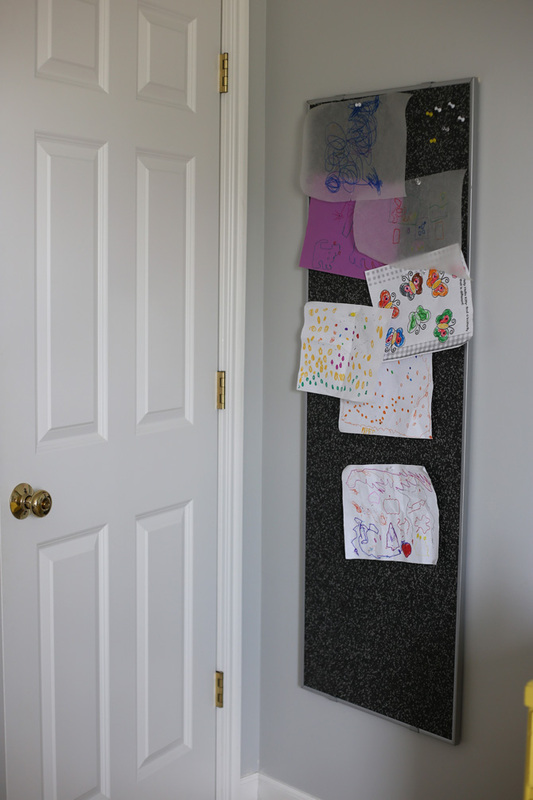 It was a pretty good sized closet, but it had a regular single door, which made it difficult to access all of the space. We planned to open up it up and reframe it. Then we could do curtains to close it off, making the most of all the storage space. I don't have many process pictures from this, because I escaped with the kids while Dustin and my step-dad went to work. I tend to under estimate how long things are going to take, but this project actually ended up nearly as simple as I hoped (easy for me to say, since I didn't do any of it). They tore out the old frame and expanded the opening to match the full width of the closet. 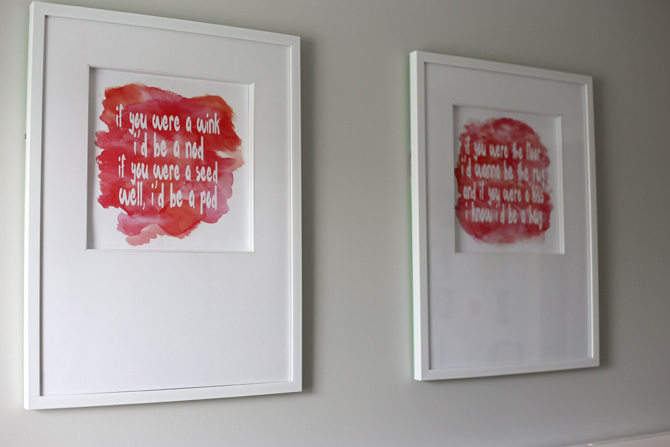 Then they reframed it, and made all my designer dreams come true by painting it a fun coral pink color (Behr Sugar Poppy- a color I actually liked the first time around!!) Widening the opening means we have spots where you can see the subfloor...eventually we'll come up with a plan to formally fix it, but for now, we just placed extra pieces of carpet to camouflage the area. So you're starting to get a glimpse into the vision for the design, right? And if you saw their quilts, then you have an idea where the rest of the color scheme is headed...But enough of my blathering...let's get to the good part! Click for full details and more pictures! 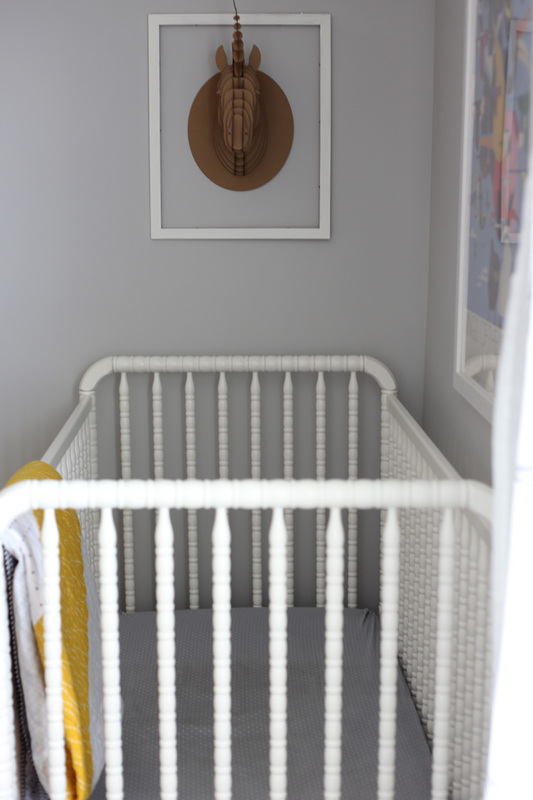 So you can see we went with the canopy bed version for now, and kept Fin's crib in the space too. She's still super happy in the crib, so we plan to leave her there as long as we can. 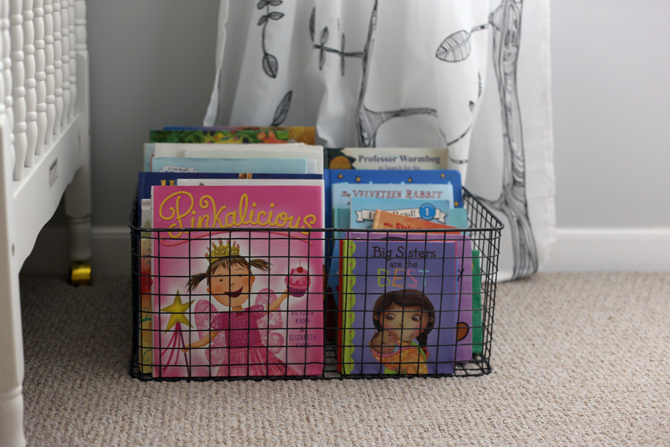 Eventually we'll flip the bed, and put her in the "ground level" bunk, and use the corner of the room for a reading nook. 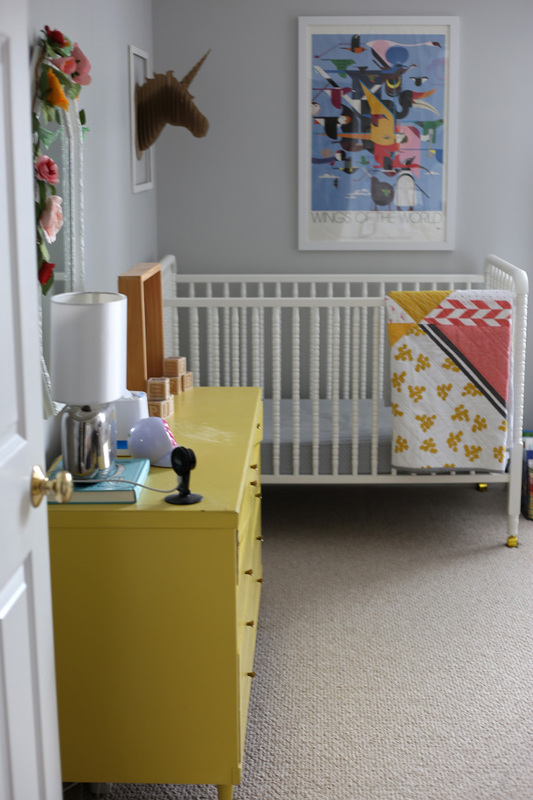 The design scheme was based on Piper's old nursery- I still loved the black/white/grey + yellow, but I added more coral to make it a little bit more girlie. Other than that, I didn't really have a theme, but more and more birds kept finding their way in, so that might be the unofficial "tie that binds". Besides the bed, most of the big pieces were things we already owned. 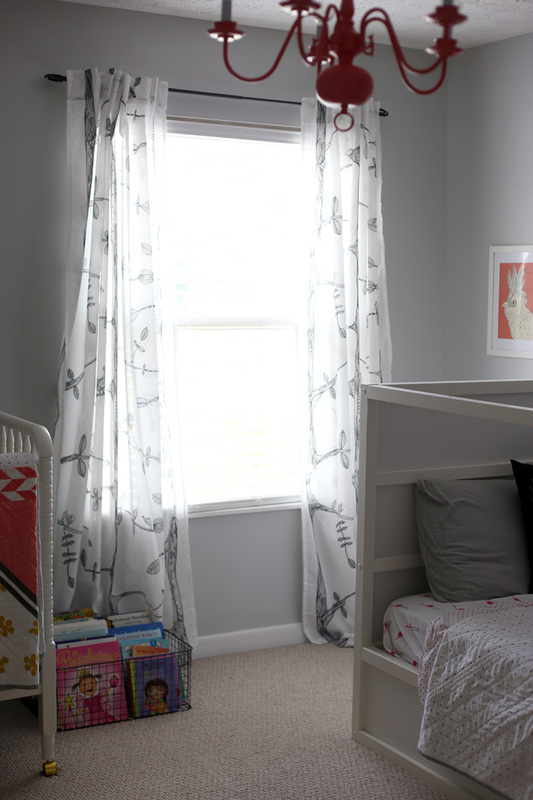 Besides new curtains and bed linens, I tried to work with existing items as much as possible, so the room ended up being a mix of old and new with a lot of handmade touches. 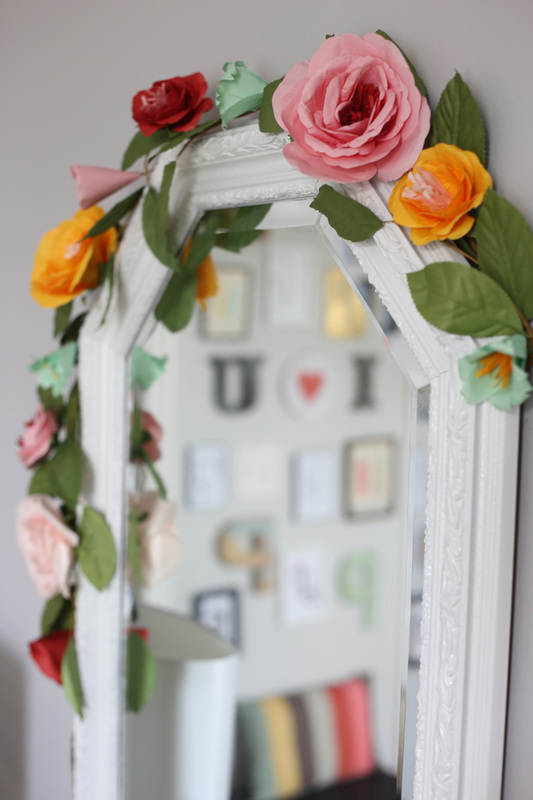 The dresser has an old mirror we found in our old house...we painted it white and then added paper flowers I found on clearance at Target (I bought three sets, not having any idea what I'd do with them, but I loved them so much, I figured I'd find someplace to put them). 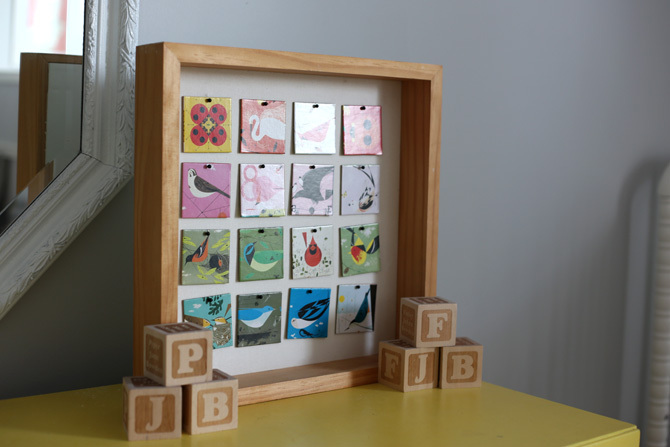 The art is a framed version of a Charley Harper matching game from Piper's old nursery, and the girls' initial blocks. 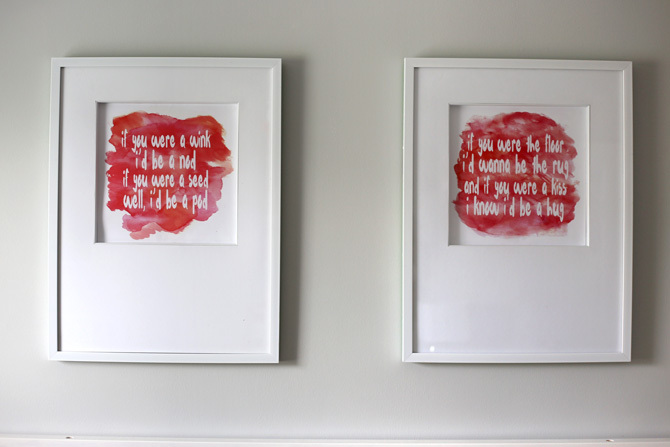 Above Piper's bed, I made two pieces of art, using the lyrics to All I Want is You, one of our family's favorite songs. At the foot of the bed is a little bench with storage for a few of the 1,000 stuffed animals the kids have amassed somehow. Fin's corner got a thrifted Charley Harper print, and a fun little unicorn. 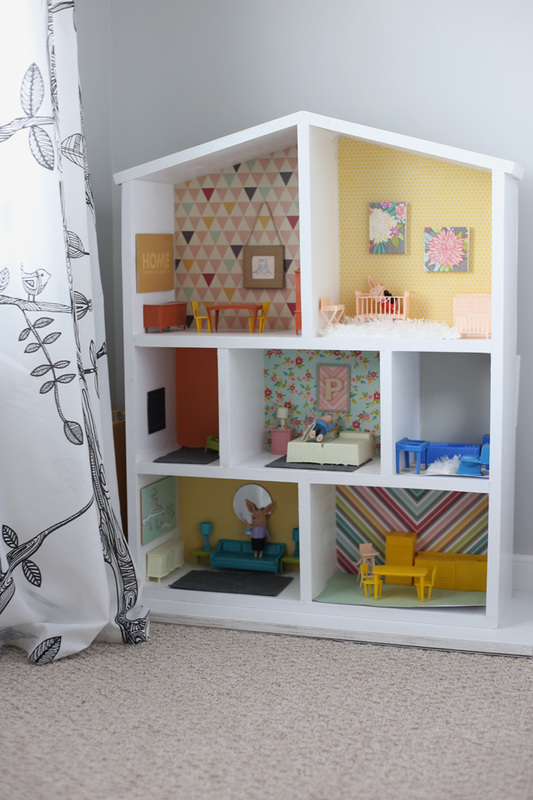 And nearby, is a spot for the dollhouse, and of course, for books. 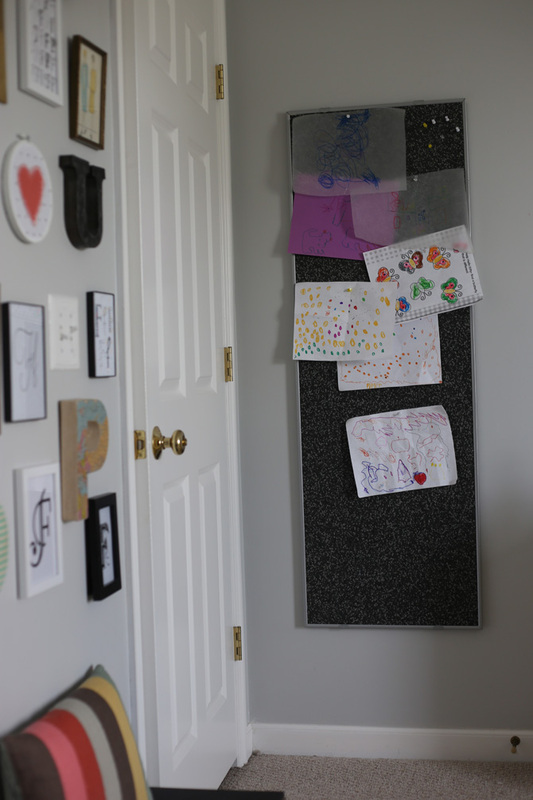 And hiding behind the bedroom door is a big pinboard, where the kids can hang all of their "masterpieces". (Without them cluttering up the space too much). And as for the closet? I love how it turned out. 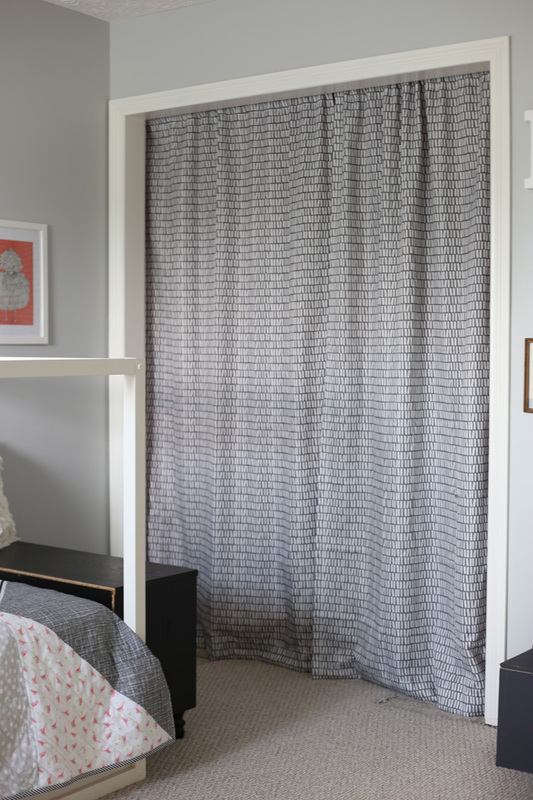 The curtains are cute, and the pink is fun, but above all, it's super functional. (and you know I love a well organized closet). 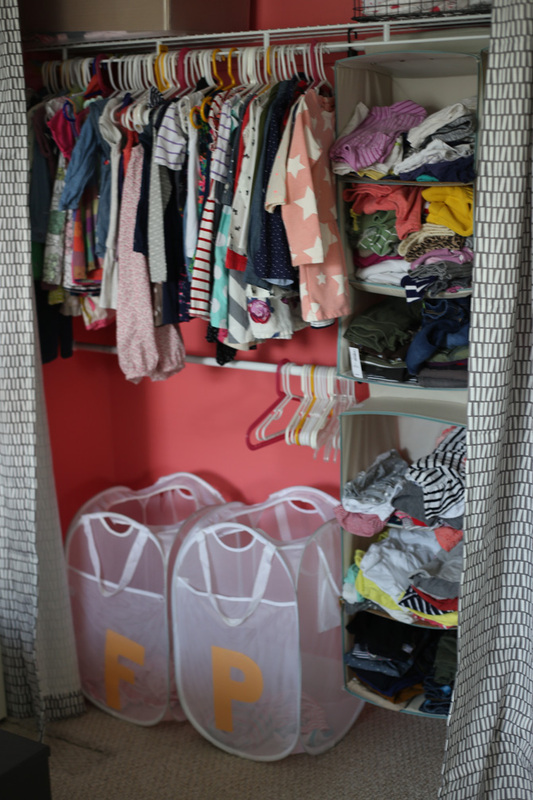 Each girl has half of the bar for hanging items, and six cubbies for their folded items (undies/socks/jammies go in the dresser). I cut letters out of felt and slid them in pockets on their hampers so they can keep their laundry sorted. (in theory, anyway). 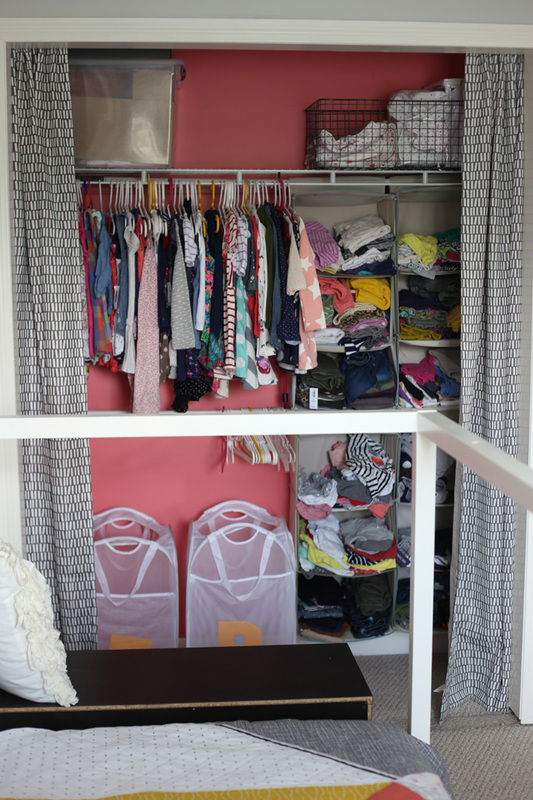 There's extra storage at the top for things like the next size up in clothes, and extra sheet sets. I know I said it before, but I really just love how it turned out. It's such a fun space, and I'm hopeful that it can grow with them as they get older. 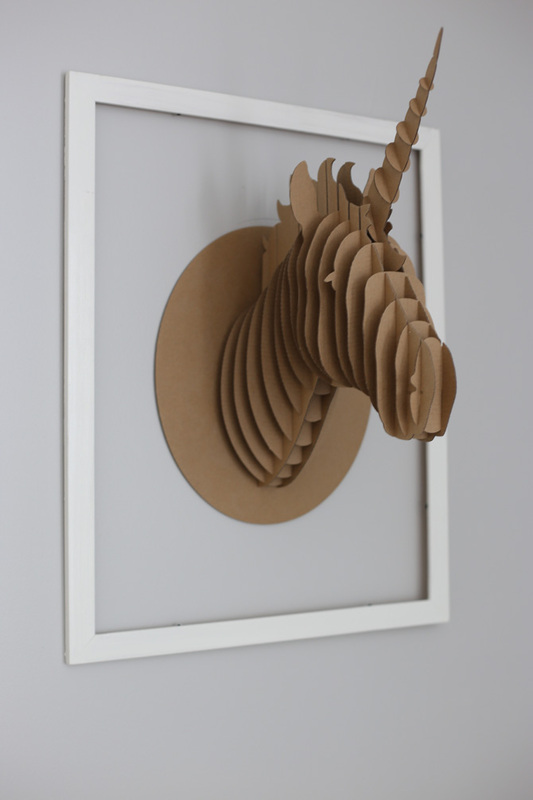 It's special for me to be able to include so many handmade projects and details in rooms for my kids. 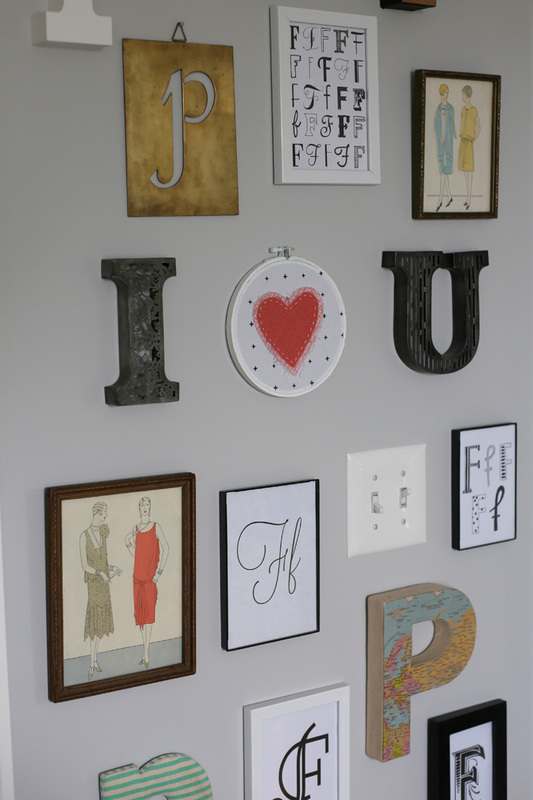 And the best part- they actually seem appreciate the little touches we did with them in mind. Piper loves her book shelf (which she fills with a crazy assortment of waterbottles, tissues, toys, doll clothes...and sometimes books), and is so excited to have a spot to hang her art (she's a busy little artist...our giant bulletin downstairs is constantly full). Fin likes to perch on the toy box at the bottom of the letter wall and read books. And they both like to play hide and seek in the curtains...and sometimes their hampers. Oh, sisters. 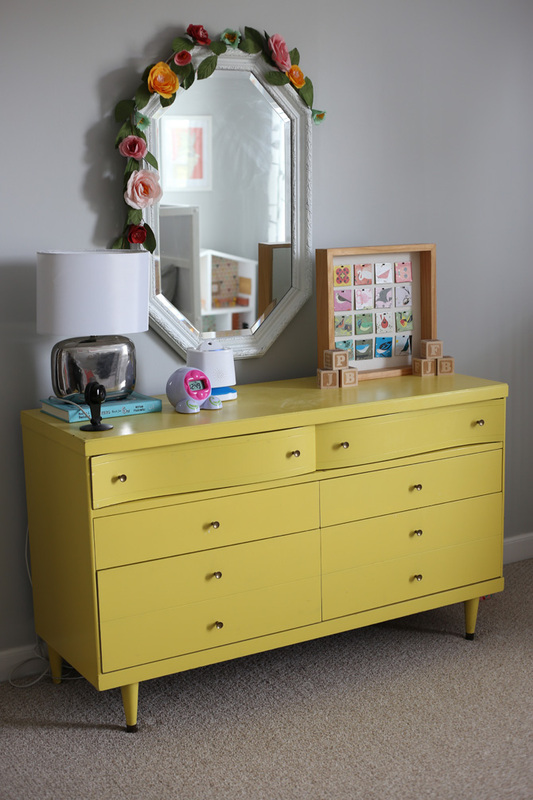 Dresser – Free “curbside find”- refinished and painted. 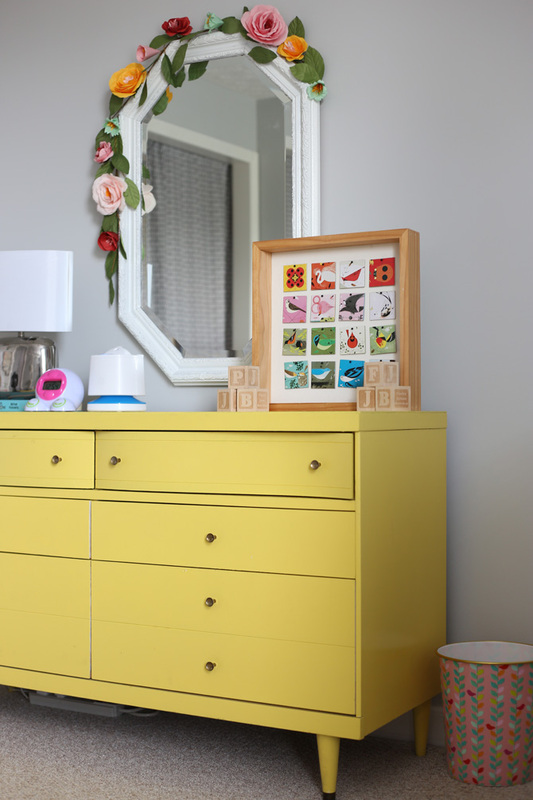 Color: Behr Citrus Zest. Crib – DaVinci Jenny Lind 3 in 1 Convertible Crib in White. 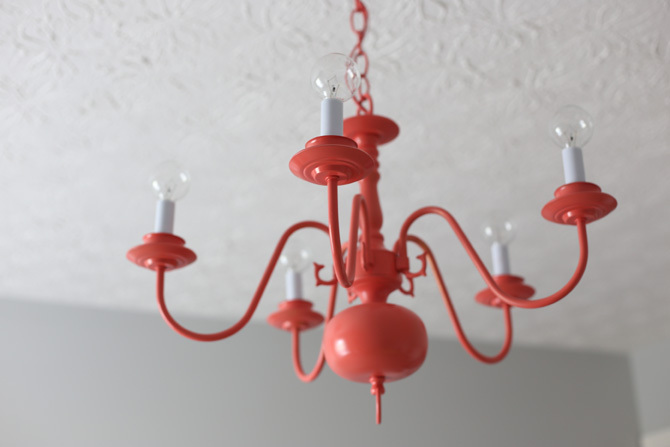 Chandelier: From the house's original dining room, painted Coral. 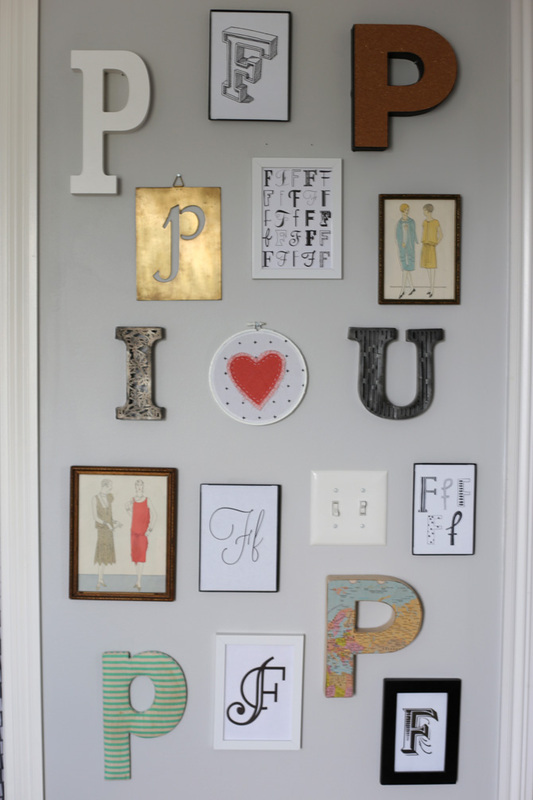 Other items not mentioned specifically- frames, letters, pillows, etc. 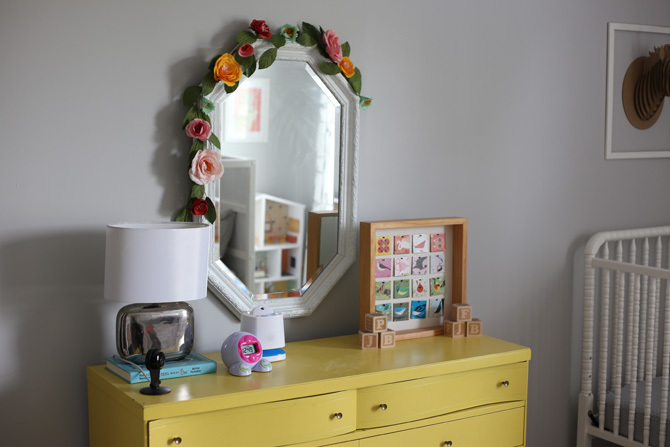 are a mix of things- mostly vintage, or old items from Target/Homegoods/T.J. Maxx/Urban Outfitters etc. P.S. Can't get enough #houseofbowden? 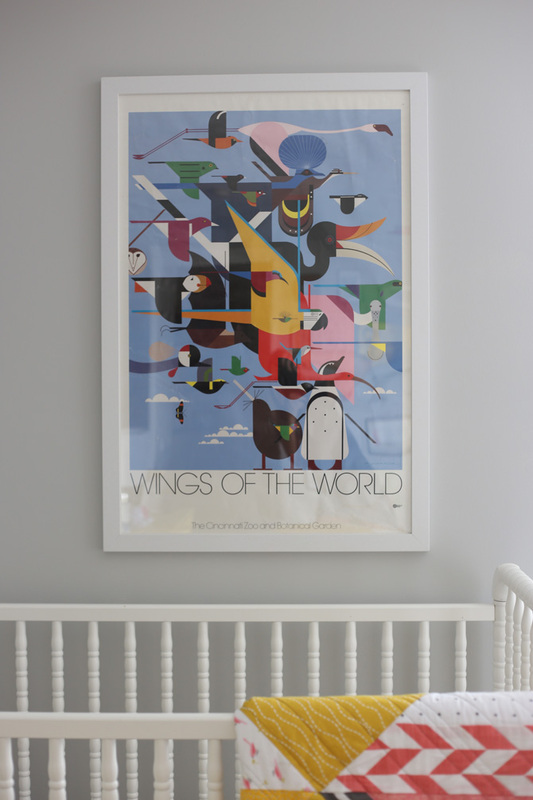 You can tour Piper's old nursery, or check out all of our house posts.